No matter how hard we try, there will always be something we fear in life. Be it spiders, death, illness, or failure, our lives are consistently plagued with fear. But without fear, how would you have something to overcome and hope for? 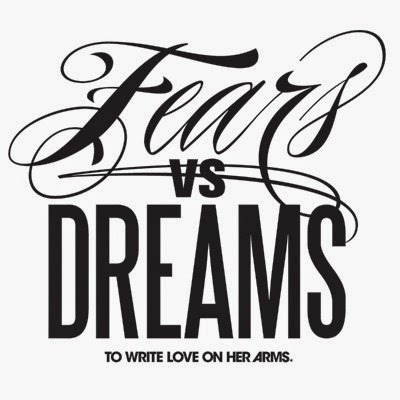 This is the concept behind TWLOHA's campaign entitled Fears vs. Dreams. Though we all have things that make us feel frightened and even hopeless, there's always a reason to keep going. If you let your fears overwhelm your life, you'll never get to live out and achieve your dreams. This is especially relevant during this week, National Suicide Prevention week. Many people who commit suicide do so in an attempt to escape their fears, as they feel they have no other option. But it's important to compare those fears to your dreams and remember that, as impossible as life can be, it can also be full of hope and fulfillment. It took me several hours to think of what my fears and dreams are. It's something I subconsciously avoid thinking about to protect myself from any emotions that may come from such deep thought. However, as difficult as it is to submit myself to the possibility of experiencing painful emotions, it is important to be in touch with yourself. Do you want to examine your own dreams and fears? Save the following image on your computer and fill it in yourself. You can submit it to the Fears vs. Dreams Tumblr account, or you can keep it for your own personal self reflection.